Every few thousand years, an unlucky star wanders too close to the black hole at the center of the Milky Way. “A single shredded star can form hundreds of these planet-mass objects. We wondered: Where do they end up? How close do they come to us? We developed a computer code to answer those questions,” says lead author Eden Girma, an undergraduate student at Harvard University and a member of the Banneker/Aztlan Institute. Girma’s calculations show that the closest of these planet-mass objects might be within a few hundred light-years of Earth. It would have a weight somewhere between Neptune and several Jupiters. It would also glow from the heat of its formation, although not brightly enough to have been detected by previous surveys. Future instruments like the Large Synoptic Survey Telescope and James Webb Space Telescope might spot these far-flung oddities. She also finds that the vast majority of the planet-mass objects – 95 percent – will leave the galaxy entirely due to their speeds of about 20 million miles per hour (10,000 km/s). Since most other galaxies also have giant black holes at their cores, it’s likely that the same process is at work in them. 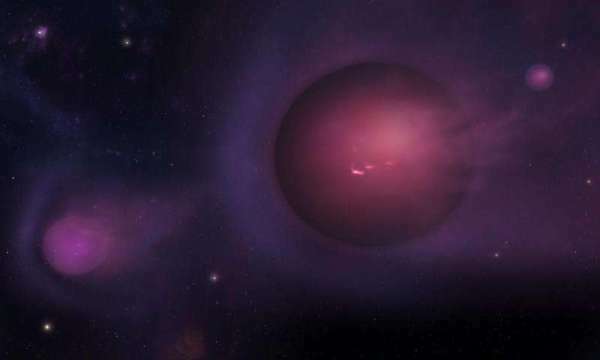 “Other galaxies like Andromeda are shooting these ‘spitballs’ at us all the time,” says co-author James Guillochon of the Harvard-Smithsonian Center for Astrophysics (CfA). “Only about one out of a thousand free-floating planets will be one of these second-generation oddballs,” adds Girma.